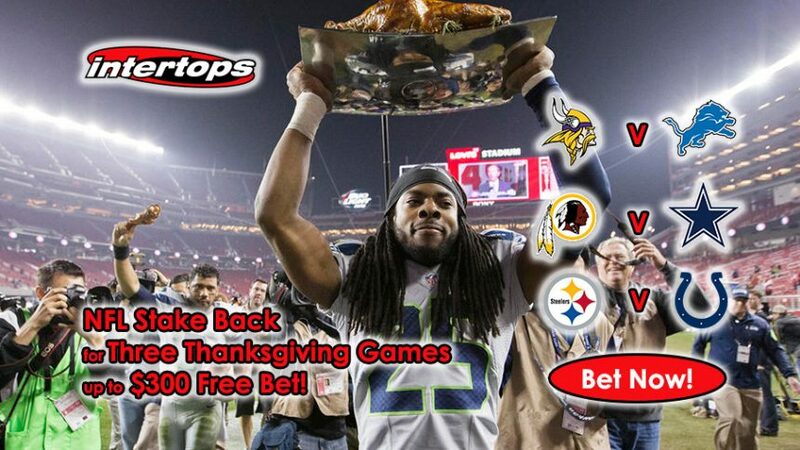 Give thanks to Intertops this Thanksgiving, because if it weren’t for them there’d be no NFL Stake Back Bonus that can see you claim your Money Back up to $300 Free Bet on three select games. All you have to do is place a wager on your preferred side, and in case something goes wrong, you’ll collect the NFL Stake Back Bonus. Vikings @ Lions: bet on the 1st Quarter spreads and totals on this game, and if the halftime reaches with the scores tied you’ll receive a refund up to $100 Free Bet with the NFL Stake Back Offer. Redskins @ Cowboys: wager on your favourite player on the ‘1st Touchdown Scorer’ market, and should he blunder and score the 2nd touchdown, Intertops will give you your Money Back up to $100 Free Bet. Steelers @ Colts: claim back up to $100 Free Bet on the ‘Team Total’ market in case Antonio Brown record a touchdown in the first half of the clash. Please use the following Bonus Code for all the three Thanksgiving games to qualify for the NFL Stake Back Bonus: WEEKLYSB. In four years time, the NFL will have celebrated its 100th year in which games are played on Thanksgiving, with the special tradition dating all the way back to the year 1920. In the first edition of Thanksgiving games – November 25, 1920 – a total of 12 teams took to the field that day, with the Akron Pros, Dayton Triangles and All-Tonawanda recording victories, according to Yahoo Sports. In the modern age, it is a football event like any other with the sole difference being a feast that goes alongside some great NFL action across millions of households in the US. If you’re the kind of betting enthusiast that prefers to bet on the outright market, then we suggest you consider placing your wager on one of the three teams. The New England Patriots are the favourites to win the Super Bowl +200 (3.00) this season, while the Seattle Seahawks and the Dallas Cowboys are both second in the running +500 (6.00) for the prized Vince Lombardi trophy. The Pittsburgh Steelers are fourth favourites +1200 (13.00), while the Denver Broncos and the Oakland Raiders are heavy underdogs +1600 (17.00) for Super Bowl LI. Celebrate Thanksgiving like it was intended to: place wagers on the hottest football action and claim up to $300 Free Bet with the NFL Stake Back Offer! Grab up to $300 Free Bet with NFL Stake Back Bonus!